Barricade's Dispatching Module Streamlines the dispatching process and improves scheduling and management. Manual methods of receiving orders from the client, creating the work orders and then confirming those orders (recording what really happened) can create a mountain of paperwork, not to mention lost dollars, at the Invoicing end. Barricade's Dispatching module simplifies this process, improves record keeping and increases profitability. A client calls in and gives his or her company name. 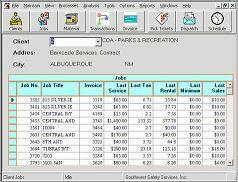 The dispatcher types in the first few letters of the clients name or scrolls down in an alphabetical listing. Once found, the System identifies all open Jobs with Job titles for that company. The caller states they want a delivery to 5th and Main, The dispatcher says I show a Job on 4th and Main, is that the same Job, (This is the area where many duplicate Jobs are created) For verification Barricade Software can identify what items are currently on the Job and if there are any other active work orders in process. If it is determined that this is indeed a new Job on can be created "on the fly" then start a new Work Order. The Driver can be assigned at this time or later on in the process. The Work Order number can be given to the caller as a confirmation and the Work Order Ticket is printed immediately.